In 1878, the Carberry district and Rural Municipality of North Cypress, then known as the Big Plain, were being settled. In the summer of 1881, the Canadian Pacific Railway reached Carberry, bringing with it a wave of settlers. The area growth was underway. The railway’s arrival encouraged grain companies to build elevators. In 1893, six companies were represented on the Carberry market: Ogilvie Flour Mills Company, Lake of the Woods Milling Company, Logan Elevator Company, Northern Elevator Company, G. Rogers Elevator Company, and Bready Love & Tryon Grain Company. Over the years, many facilities were bought and traded, bringing other companies to Carberry for varying periods of time. These other companies were the Colonial Elevator Company, Manitoba Milling Company, Lyons Elevator Company, Winnipeg Elevator Company, William Hope Grain Company, Carberry Elevator Company, Murphy’s Grain Compoany, Reliance Grain Company, Manitoba Pool Elevators, and United Grain Growers. In following years, elevators were constructed at Wellwood, Fairview, Brookdale, and Gregg to provide closer service for farmers north of Carberry. Later, elevators were also constructed at Harte and Petrel. The last company to remain in the Town of Carberry was United Grain Growers whose elevator was dismantled in April 1983, the district’s centennial year. 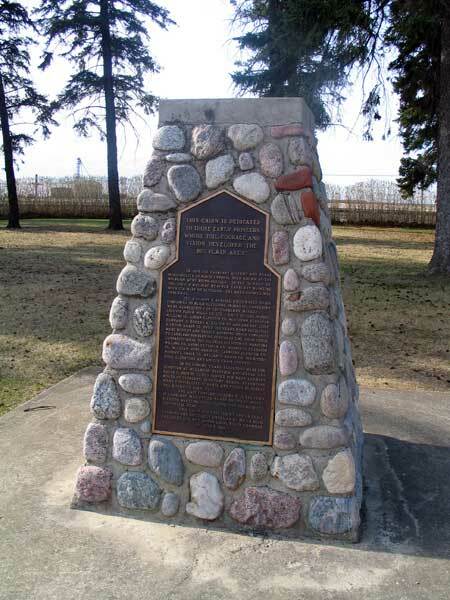 This monument on Fourth Avenue, opposite the Municipal Office, was erected by United Grain Growers and unveiled officially on 6 July 1983 by company president L. F. Hehn and local board chairman Lester Baron.